The game Sunday in Charlotte matches the two best teams in the NFL’s playoff field of eight. So let’s just save all the glitter and hype and call this Seahawks-Panthers the Super Bowl. Perhaps in the confusion this week about NFL relocation to Los Angeles, you may have missed news of another relocation. Super Bowl Bowl 50 has been moved. To Charlotte. Sunday, 10 a.m. PT (FOX). The match doesn’t have the hype, glitter, tassels and stripper poles that typically identify the traditional Super Bowls. But the Panthers and Seahawks are the two best teams in the field, and they play Sunday, not Feb. 7 in Santa Clara. Right? It’s the NFL’s marquee matchup this season. The 15-1 challengers against the two-time NFC heavyweight champions. Everything else? Lounge acts. Kenan Thompson warming up the crowd for Chris Rock. “That’s how I look at it,” said Seahawks TE Luke Willson, “as far as as the way we finished off the season, and the way their entire season went. No other teams in the NFC, not even Arizona, are of the same pedigree. Should the Seahawks and Cardinals, who host Green Bay Saturday, prevail this weekend, they will meet in the NFC Championship. But the Seahawks beat the the Cards 36-6 on Jan. 3. The luster will be off; it won’t be the same as Carolina, which beat the Seahawks 27-23 Oct. 18 upon the sacred rug of the Clink. The AFC usually has a case with New England that every postseason game is a Super Bowl equivalent. But the defending champs, damaged by injuries, have lost four of their previous six games. Even coach Bill Belichick had a black eye this week. The rest of the AFC field has more question marks than exclamation points. Carolina and Seattle are the best teams. That’s it. Move the Super Bowl’s hyperventilated halftime show across the country, and let’s get it on. 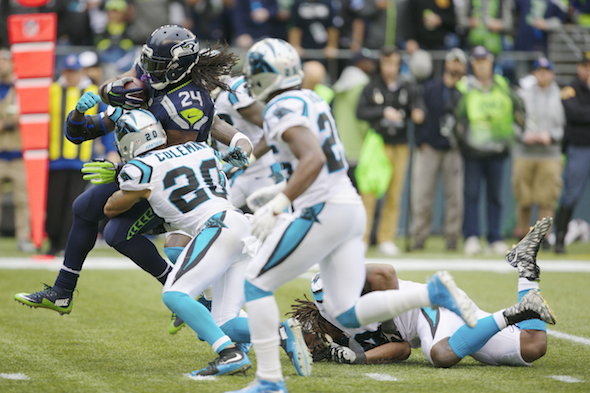 The edge for this game was set with Carolina’s win over Seattle. It looked to some then to be the final blow to the teensy dynasty begun by the Seahawks under coach Pete Carroll. Nice run — his eight postseason wins are one more the franchise accumulated in its history before his arrival — but at 2-4 this fall, the Seahawks season looked cooked. Especially after Panthers QB Cam Newton directed four scoring drives of 80 or more yards, including two in the fourth quarter. You know, the-king-is-dead-long-live-the-king medieval succession model. Bennett begs to differ about whether there has been a change in NFC leadership. “You can never count anybody out in the NFL, especially at mid-season,” he said. “At the beginning of the season, everybody seems like a Super Bowl contender. Got to let the season unfold. When you do, you see the same teams back every year. It’s not a surprise. Bennett is right about Seattle’s single-season evolution. Coach Pete Carroll admitted recently that getting over the devastating loss in the Super Bowl took a long time. Equally vexing was the inexplicable contract holdout of SS Kam Chancellor, who missed the first two games. Because of injuries, FS Earl Thomas missed the entire preseason. And Bobby Wagner, who joins Carolina’s Luke Kuechly as the game’s best middle linebackers, missed the Panthers game with injury. Those travails explain much of why the Seahawks defense in the early season gave up 34 points to the Rams, and 27 each to the Packers, Bengals and Panthers. Because those matters are resolved, and Jeremy Lane has returned to health to fix the weakest defensive position, the cornerback spot opposite Richard Sherman, the Seahawks make the argument that the current outfit is not the same as the group that blew a 24-13 fourth-quarter lead. “Those guys are critical pieces to who we are,” said defensive coordinator Kris Richard Thursday. “It’s the relationships, the camaraderie, the experiences and what they’ve been taught over the years — you lose a little of that each time they’re not out there. Well, it did matter for playoff seeding. The Seahawks’ 2-4 start cost them a shot at the division championship, meaning no home postseason games and no bye, big advantages they had the two previous seasons. So they have to win three road games in a row to reach the Super Bowl, after winning just two road playoff games in the 39 previous years of the franchise’s existence. But after barely surviving the most frigid game in the history of Minnesota, where cold was invented, the Seahawks see a trip to North Carolina and think about taking golf clubs (forecast: 47 degrees, 20 percent chance of rain). That, plus the fact that they have won six road games in a row, as well as the past three games they’ve played in Charlotte, suggests that they are not intimidated by surroundings or circumstances. The Seahawks go from frigid to formidable: The foe is a 15-1 team that topped the NFL in turnover ratio and is led by the NFL’s Most Valuable Player-presumptive in Newton. There you have it — the real Super Bowl. Throw in the forecasted return from hibernation of Seattle’s Beast, Marshawn Lynch, and the NFL can put up the “Closed” sign on Levi’s Stadium in three weeks. glitter, tassels, stripper poles, hyperventilated halftime shows . . . you go, Art! Nothing succeeds in America like excess. Great article, Art. I hope that when the final whistle blows on Sunday, you’ll have another chance to write a jubilant piece about what transpired in Charlotte. Jubilation will come from not standing at the outdoor light-rail station in Minneapolis at 12 below. It’s a shame Graham can’t play but let’s get it started. Eight catches on 12 targets vs. CAR in October. He would be an asset against this front seven. As usual, an insightful and entertaining read from Art Thiel. Hey, Ben G! Good to hear from you. Miss working with you. Can’t wait for the game with that inspiring bit of prose. Your correct in aligning a title match in the square circle to a knock down drag out on the gridiron. Caution is advise take at lease two Zanex and no hard objects near the TV. GO HAWKS!! ‘Tassels and striper poles’ – still sippen out of that elixir glass and that bottle of blue pills sitting next to your keyboard, eh? Just getten back atcha for your last comment response to me about my typing one handed while doing the 12’s Beast Mode crotch wave. All kidding aside Art, another bulls eye. If they don’t win this one, I’ll consider it two consecutive Super Bowl losses, and I’ll be skipping the bump-n-grind affair on the 7th. The 50-year anniversary stuff at the Santa Clara event might be fun. But otherwise . . .
Fun as in maybe replaying clips of the most memorable half time shows, such as Janet Jackson’s wardrobe malfunctions etc. has a sooper bowl team ever been 0-2 vs. the st looey rams before? Los Angeles Rams to you, pal. Hoping it will be that NFC West showdown next week but first things first. To borrow a phrase the Carolina players are throwing around….to be the best you got to beat the best. If Seattle’s season is to end in parade this is a huge stepping stone in beating the best.Hope we whip this cocky crew good in their home park. Go Hawks! So a 12 calling another team cocky. Rich. Not used to seeing the Hawks in the underdog role I guess. I will try to work on my grace and do the Troy Aikman living in the past thing to get the smiles a going again. A nice sound win would shut them up though…lets just hope the SB40 crew isn’t working this wknds game. The Seahawks don’t get to go golfing until mid-February. Period. They certainly don’t make it easy for themselves, but in the end it’s always been outstanding to watch it unfold. 2016 3rd coldest game ever; Early SB matchup; Win out on the road as #6 seed?………..why not?! Good that you’re a tension-aholic. It would be way different if they didn’t always find a way to pull through! I have always wondered if the “all-road-games-and-no-bye” playoff path works towards the Hawks advantage. Last year is an interesting comparison, as both games at the Clink were probably closer than they should have been, and coming out of the off week they seemed a little too comfortable. Not to mention the inevitable pressure on the home team to perform better than there visitors, which the hawks have 0% of right now. So maybe ravaging the countryside as road warriors has allowed them to stay focused and regain their mojo. It would be really cool if they run the table… GO HAWWWKS! Carroll and numerous coaches have some dread of the bye week because it breaks a hot team’s rhythm. It’s a help for teams who have short-term injuries, but the Seahawks with Lynch back are healthy for January.